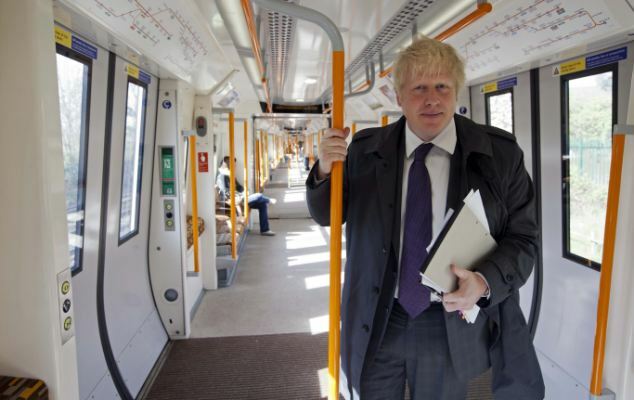 Boris Johnson’s £60m cable car was branded “pitiful” today as it was revealed that it is being used by just four regular commuters. Figures obtained under the Freedom of Information Act showed the “Emirates Air Line” service between Greenwich Peninsula and the Royal Docks attracted just four Oyster card holders using it more than five times a week, triggering the regular users’ discount. The figures, obtained by 853blog.com, also show that the number of weekly users in the second week in October were 23,000 compared to 42,500 for the same week last year. On Sundays - the cable car’s busiest day - users dropped to 6,300 from 16,200, suggesting the cable car’s novelty as a tourist attraction is fading. On top of the four regular Oyster commuters, just 18 multi-trip passes – allowing users to pay in advance for 10 journeys across a year – were sold, compared with 41 last year. Travelcards and Freedom Passes are not valid on the cable car, with Oyster card-carrying passengers charged £3.20 each way to use it. Caroline Pidgeon, Leader of the Liberal Democrat London Assembly Group, said: “The cable car is attracting a pitiful number of regular commuters. For people that need to cross the Thames every day there are clearly cheaper and quicker options open to them. Quite frankly if you have a Zone 3 Travelcard why pay again to use the cable car when the DLR is a far better way to get to work? “In addition to not attracting regular passengers it is also clear that the cable car can’t generate enough passengers and income from one off visitors, including tourists. Clearly fundamental questions now have to be asked about its ticketing strategy. Having poured so much public money into the cable car the Mayor should now finally accept that the only way it will generate a reasonable number of regular passengers is by becoming an integral form of public transport. People with a Freedom Pass or a Travelcard should not be charged at all and the standard fare for a person with an Oyster card should be the same as a bus fare. Pretending that nothing has to change is no longer an option for the Mayor and TfL”. London Underground will run weekend services 24 hours under plans that also involve ticket office closures and up to 750 job cuts. The Night Tube will provide services on the Piccadilly, Victoria, Central, Jubilee and Northern lines. But Transport for London (TfL) said every ticket office would close by 2015, resulting in the job cuts. The RMT union said it had "not ruled out" strike action in the run-up to Christmas over the "lethal" cuts. For action to take place the RMT (Rail, Maritime and Transport Union) would have to hold a two-week ballot and give TfL seven days notice. In a tweet the BBC's transport correspondent Richard Westcott said: "RMT just told me they haven't ruled out calling for strikes b4 Christmas on the #londonunderground"
The transport authority is facing a budget reduction of about £78m in the financial years of 2013 and 2014 and said the plans would help it save more than £40m a year. TfL says six major central London stations will have special customer points to help tourists and that every station will be staffed while the tube is running, with workers moved out of ticket offices into station booking areas. Closing all ticket offices is one of the most radical changes to the Tube in its history - it's up there with electrification and the Oyster card. And it will be a huge sell for London Underground and the Mayor. We knew cuts were looming but what they have done is bundle 24hr weekend running of the Tube into the same plan. Cynics would say London Underground are trying to undermine the unions position by sweetening the pill for the travelling public. A later running tube will be very popular. They've also said there will be no compulsory redundancies. The unions have already said they'll use everything at their disposal to head this off. They would not want their members at stations in outer London on their own at 3am with just an iPad for company. They will not want job losses even if the promise is all stations will be staffed. It's difficult to not see the first tube-wide strikes in four years. Ultimately, you suspect this will be decided in the court of public opinion of the Tube's passengers. The initial plans for the 24-hour Night Tube include overnight trains on Friday and Saturday, with plans for it to expand over subsequent years. 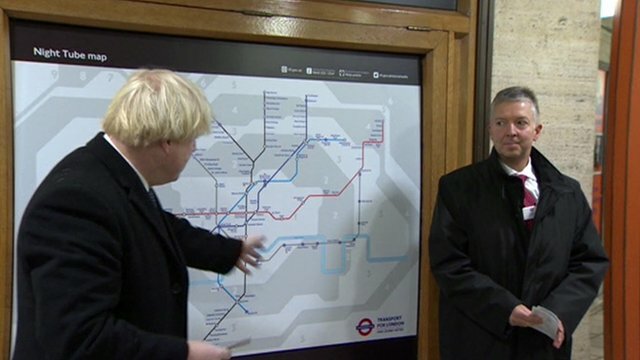 Mayor of London Boris Johnson, said: "This is just the first stage in an opening up of the tube network to become 24 hours. "For 150 years the Tube has been the beating heart of London, its tunnels and tracks providing the arteries that have transported millions of people and helped to drive the development and economic growth of our great city." London Underground will now go into a 90-day consultation on its proposals but says there will be no compulsory redundancies and has promised that every member of staff who wants a job and who is "ready to be flexible" will have one. The managing director of London Underground Mike Brown, said: "All Tube stations will continue to be staffed and controlled in future, with more staff visible and available to customers." 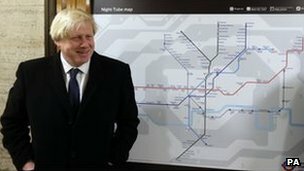 London Mayor Boris Johnson said it was time to take the Tube "to the next level"
But the RMT, which represents most of the station staff who would be affected, has said it would "fight these plans with every tool at our disposal and that includes political, public and industrial campaigning on an unprecedented scale". RMT General Secretary Bob Crow said the "proposed cuts will decimate staffing levels and hit the most vulnerable users" of Tube services. He said: "The mayor must believe he is some sort of magician if he thinks he can slash a thousand jobs and still run safe services when everyone knows that staffing has already been cut to the bone while passenger demand continues to rise. "Throwing in the plan for night time operation at the weekends is just a smokescreen to try and camouflage the real issue which is a savage cuts to jobs, access and safety." Manuel Cortes, leader of the Transport Salaried Staffs' Association rail union, accused the mayor of being the "hypocrite of the decade". Some 950 staff of London Underground’s 5,740 ticket hall personnel will lose their jobs in a move that will save Tube chiefs £270m in salaries over next five years. With 200 new posts on the planned Night Tube, net job losses amount to 750, LU said. In a major-shake of the Tube, most ticket offices will be shut and with some of the lucrative floorspace let to retailers. There will be an extra 150 ticket machines with full automation in place by 2015. LU said they were phasing out ticket offices as they have become obsolete since the introduction of Oyster and are used in just three per cent of journeys. LU insist no station will be left unstaffed from the first train to the last. Passengers will instead benefit from an enhanced experience with back-office staff redeployed to the frontline. They will each by armed with tablet computers to assist in a variety of “customer care” roles in a move that will revive the distinctive magenta uniforms worn by Olympic volunteers. A third more staff will be on duty at six “gateway” stations - Euston, Heathrow, King’s Cross St Pancras, Liverpool Street, Paddington and Victoria. These, with a seventh at Piccadilly Circus, will boast “Visitor Information Centres” - a larger version of the temporary booths for the benefit of Olympic visitors and the only remaining place to buy a ticket over the counter . At the 125 smallest Tube stations, the headcount will be cut with a supervisor responsible for six local stations. Mr Brown claimed that job cuts to be made by Easter 2015 would be achieved entirely through voluntary redundancy due to a large number of staff approaching retirement age. Tube unions got their retaliation in early by threatening to strike over the cuts before the detail was announced today. The last industrial action came in a series of four one-day strikes in 2010. Seats should be ripped out on the most overcrowded train services to create cheaper ‘standing only’ carriages, ministers have been urged. The railways should follow the model of budget airlines like Ryanair and easyjet who offer cheap, no-frills travel in contrast to the high-end services run by the likes of British Airways or even private jets. Passengers in the new economy class carriages would pay up to 20 per cent less than those sitting in standard class, under plans drawn up by the Institute for Economic Affairs. It is claimed that a return to third-class travel for the first time since 1956 would be a cheaper way to ease crowding than spending billions on new lines and stations. 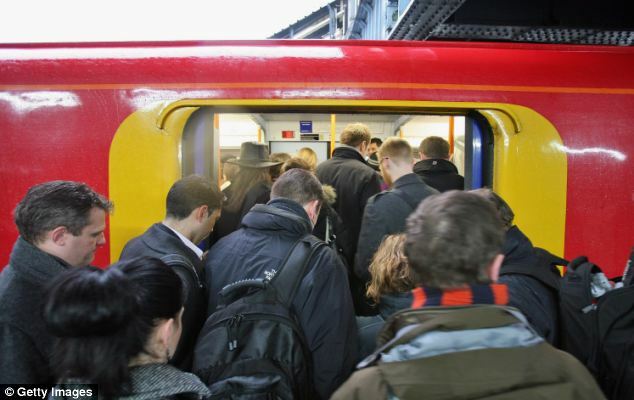 Transport expert David Starkie, who wrote the report for the IEA, argues rail commuters should be given more choice about the quality of service and the price they pay. ‘An additional high-density “economy class” section could be introduced on commuter trains, access to which would be priced during the peak at a large discount to current fares. The 1844 Railway Act stipulated that all third-class passengers should be carried in covered accommodation. Railway companies also began providing lighting in third-class carriages. However, whereas there were several oil lamps in the first class carriages, third-class carriages only had one. The Pullman car, introduced in Britain in 1874, created a new level of comfort. Passengers already crowd at the front of trains arriving at the final destination, even if there are empty seats at the rear, because they want to beat the crush at ticket barriers. The report proposes introducing an ‘additional high-density section to commuter trains’ of three carriages which would be 20 per cent cheaper than the standard peak price. ‘A discount of this amount would place the price of “economy class” about mid-way between the standard class rail fare and the fare for commuter coaches,’ the report said. The discount could be less for shorter journeys and more for longer commutes. The carriages could be modelled on London Overground trains service, with flip-down seats running down the edge but with most room giving over to standing space. It would mean trains could carry more people without investing in additional rolling stock or lengthening platforms. It could even be cheaper to run the new trains. ‘Stripped of seat furniture train carriages would be lighter,’ the report said. It would also be ‘substantially’ quicker for passengers to board and get off the train, with the potential to improve service reliability. It is claimed all passengers would enjoy the benefits of the new third class service. Those choosing the economy class would save money, while those opting for a seat would ‘enjoy higher service quality not having to share their space with standing passengers’. It could mark the return of the drinks trolley to standard class carriages if overcrowding in the aisles was reduced. The report suggests the discounted ticket should not cost train companies money, because more passengers would be able to board each service. Last month the Department for Transport insisted it was not planning to reintroduce third-class travel after leaked plans to re-privatise the East Coast main line from London to Aberdeen included proposals for three different classes of travel. Ministers have suggested it could be an additional class of travel between the existing first and standard classes – broadly equivalent to a 'premium economy' class on airlines. Transport Secretary Patrick McLoughlin also proposed stripping out first class carriages from busy routes to make more room for standard ticket holders.